Create colorful custom designs on leather with Angelus Acrylic Leather Paint. Its flexible, non-cracking formula makes it ideal for painting sneakers, boots, jackets, purses, and other leather goods. 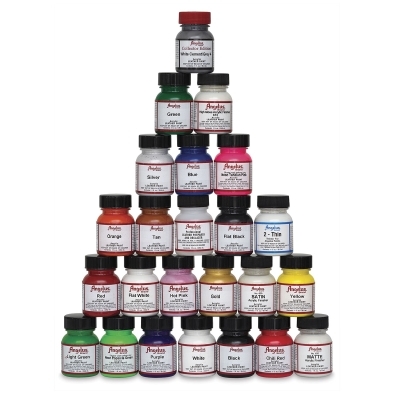 This high-quality leather paint is easy to use and available in a range of bright, opaque colors. ® Angelus is a registered trademark.